GIFT WRAP. This 4 1/2" wide oval birthday candle is about 10 " high, weight about 3 lbs. Made just for you when order is requested. 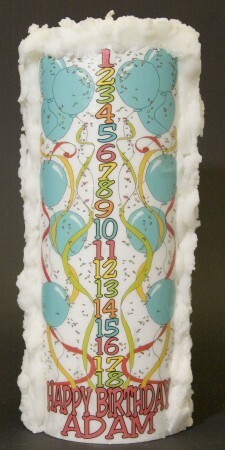 This quality and unique custom made Birthday Countdown Candle has graphics wtih TEAL BLUE balloons and streams in red, limegreen and gold. You may purchase this candle on our secure on-line site or call anytime to place your custom order. with the Name. CAN ADD BIRTH DATE (under name) AND WHO THE CANDLE IS FROM (in very small letters in the streamers) NO CHARGE. You provide along with a "Happy Birthday" message to go on a FREE CUSTOM CARD made just for you. 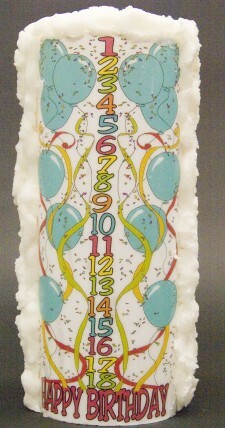 The 4 1/2" wide oval birthday candle is about 11" high, weight about 3 1/2 lbs. Made just for you when order is requested, and has COMPLIMENTARY GIFT WRAP. Email me the message you would like put the card. This quality and unique custom made Birthday Countdown Candle has graphics with Teal Blue Balloons, happy birthday, name, date and if you like, who the candle is from. All candles are designed and hand-crafted by The Candy Lady in a Dallas Design District Studio, utilizing only the highest grade of wax creating a clean long burning candle. You may purchase this candle on our secure on-line site or call anytime to place your custom order. RUSH ORDER $10.00 (See Last Item This Page). with the ADD BIRTHDATE (under the name) and WHO THE CANDLE IS FROM (in very small letters in the streamers) AT NO EXTRA CHARGE. COMPLIMENTARY GIFT WRAP, CUSTOM MADE BIRTHDAY CARD. Name you provide along with a "Happy Birthday" message to go on a card made just for you. This 4 1/2" wide oval birthday candle is about 12" high, weight about 3 1/2 lbs. Made just for you when order is requested, and has complimentry Gift Wrap. RUSH ORDER $10.00 EXTRA. Email me the message you would like put the card. RUSH ORDER $10.00 (See Last Item This Page). ALL CANDLES DESIGNED AND HANDMADE IN OUR TEXAS, DALLAS DESIGN STUDIO, utilizing only the highest grade of wax. CAN ADD BIRTH DATE, also WHO THE CANDLE IS FROM (in verry small letters in the streamers)GRAPHICS CAN BE CHANGED TO ANY OF THE BIRTHDAY GRAPHIC DESIGNS, AT NO EXTRA CHARGE. COMPLIMENTARY GIFT WRAP, CUSTOM CARD . This 4 1/2" wide oval birthday candle is about 11" high, weight about 3 1/2 lbs. Made just for you when order is placed. This quality and unique custom made Birthday Countdown Candle has graphics wtih Red balloons and streams in limegreen and gold.. All candles are designed and hand-crafted by The Candy Lady in a Dallas Design District Studio, utilizing only the highest grade of wax creating a clean long burning candle. 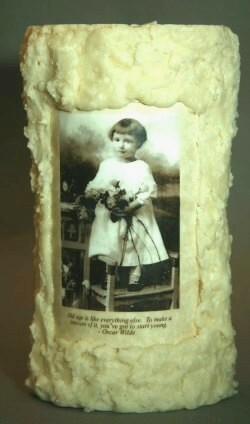 You may purchase this candle on our secure on-line site or call anytime to place your custom order. RUSH ORDER $10.00 (See Last Item This Page). CANDLES CAN BE MADE IN ANY OF MY BIRTHDAY CANDLE DESIGNS. With the Name. CAN ADD BIRTH DATE,(under the name) AND WHO THE CANDLE IS FROM, NO EXTRA CHARGE. You provide along with a "Happy Birthday" message to go on a card made just for you. 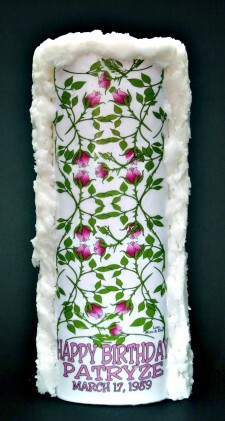 This 4 1/2" wide oval birthday candle is about 12" high, weight about 3 1/2 lbs. Sent IN COMPLIMENTARY GIFT WRAP. RUSH ORDER $10.00 (See Last Item This Page). This 4 x 9 birthday cande was made from an invitation to a 100th birthday party, written part of the invitation is on the back of the candle. Finished product can be sprinkled lightly with a micro dusting to add an extra sparkle. Wrapped in a soft silver or gold netting tied with ribbons. If you are going to order this product and have a Special Request or Instructions please use the special Notes box below. You may need to call us after ordering this candle. 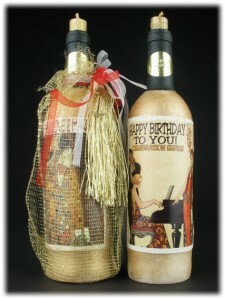 This elegant custom made wine bottle candle comes gift wrapped and can be personalized for your needs. Available in any scent or unscented, in off-white, dk. green or burgandy. Height 11.42" x 2.76" wide. Burns approx. 250-300 hours. THE WHOLE WINE BOTTLE IS A CANDLE. Call or 800# for custom made requests or email us with your request! Also Great for Anniversary and special occasions. If you are going to order this product and have a Special Request or Instructions please use the special Notes box below. You may need to call us after ordering this candle. RUSH ORDER $10.00 (See Last Item This Page). For baby showers, birthdays, and other parties. This custom made, wrapped Star Wish Candle tied with colored ribbons and a custom tag saying "A Wish for (NAME OF BABY)". Inside the verse reads: Light your Wrapped Star Wish Candle, making the first wish for (NAME OF BABY) , and the rest of the wishes for you! Custom tag, color yellow, scent Wishes, color yellow, scent: Pomegranate.